February Family Fun Calendar - Easy, Affordable Activities for Everyone! Who’s ready for another month of family fun? The February family fun calendar is ready to help you connect with your family all month long! I have been loving having these calendars to help me make the most of my time with my children. Planning time with our busy family has never been easier and based on the comments I’ve received, you feel the same! The February family fun calendar has 28 activities for your family to enjoy together. These affordable ideas are simple enough for even the busiest of families. Remember, make the calendar work for you. Look ahead to plan and skip around if you have to. The family fun calendar is here to help you, not stress you. I’ve included links to activities for your convenience. Subscribers receive the family fun calendar delivered to their email for free every month. Not a subscriber yet? Great news, you can sign up below! And if you’re looking for more fun family ideas, check out the Easy Family Fun Pack! 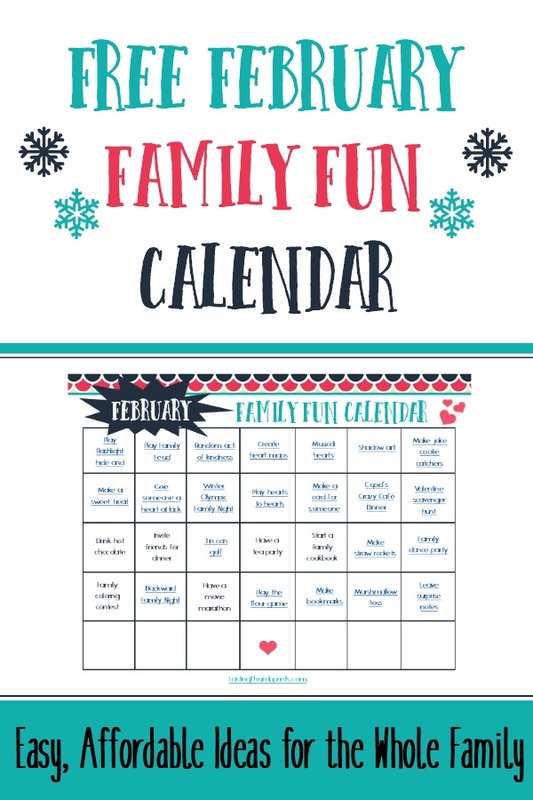 Previous Post: « January Family Fun Calendar – Start the Year Off Right!